Plums are in season! So at charlotteats we are eating Plum Kuchen for desert. Plum Kuchen (or cake) is a traditional German dessert that uses the simplest ingredients and is easy to make. It is the perfect end of summer dish and uses a good 2 kilos of plums. (Making good use of those farmers market or side of the road bushels). 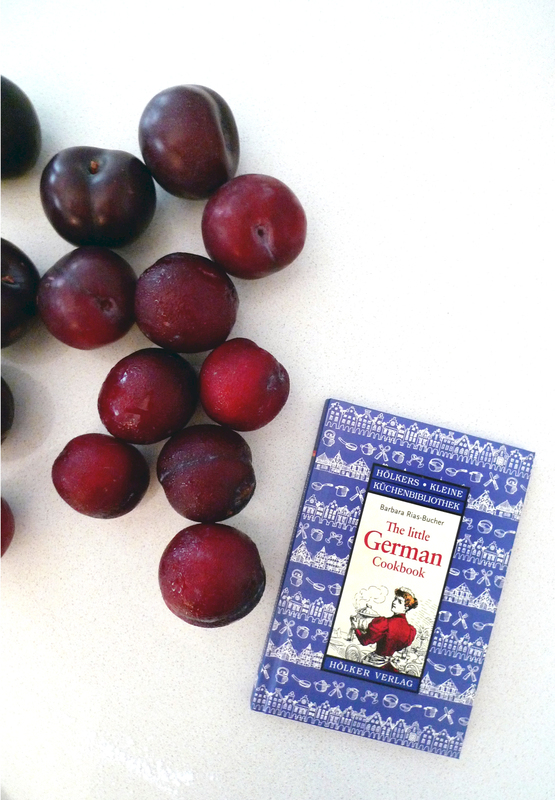 Germans love Plum Kuchen and my husband is German. Enough said. No seriously, when there’s plum cake in the house, it does not last long. My husband walks into the house and instantly has a smile on his face and it makes me so happy that I can make this for him. It was an instant success with Charlotte too; although she did eat mostly the plums. Melt the butter and let it cool lukewarm. Mix the flour with the baking soda, stevia and salt in a bowl. Add 2 Tbsp liquid butter, the milk and egg. Stir for 10 minutes or until bubbly and not sticking to the bowl. Cover and leave to rise in a warm place for 40 – 60 minutes until the dough has risen. In the meantime wash, halve and stone the plums. Deep cut the halves but do not slice. Knead the dough thoroughly on a floured working surface, roll out on an oiled baking dish. Press the plums shingle-style (overlapping) with the skin side down into the dough. Leave covered for another 15 minutes. Make crumble topping: Combine flour, brown sugar, and cinnamon in a bowl. Using your fingertips, rub butter into flour mixture until mixture resembles coarse breadcrumbs. Sprinkle topping over cake mixture. Brush the rest of the butter on the plums and sprinkle with the crumble topping. Bake the cake for 35 minutes (on the middle rack). Turn off the oven and return the cake to draw for another 5 minutes. Take out and leave to settle for 20 minutes. Cut into pieces and serve immediately or lukewarm. – Serve with lactose free cream or ice cream.